What is a full mouth reconstruction? A new smile is a wonderful often giving people sef confidence and a sense of well being. For many patients there are numerous benefits connected to reconstructing a smile. Correcting TMJ disorders, often leads to dramatic changes in appearance far beyond the teeth. 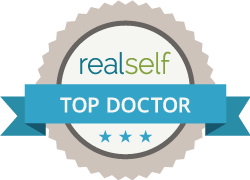 The results can be so dramatic it is often called a virtual facelift or a dental facelift. Patients with overclosed dentitions look and feel older than they really are and are more prone to sleep apnea and poor posture. Did you know that those sleepless nights, migraine headaches and back pains that you feel might be the result of your TMJ? Often caused by some sort of trauma to your mouth, the condition can also occur because of an eroded disk, missing cartilage or misaligned teeth. It can cause symptoms that range from a jaw that locks or pops when you move your mouth to pain in your shoulders and neck. The treatments available for TMJ often relate to whether your doctor determines that the cause of your TMJ is related to the muscles, joints or a combination of factors. Mouth rejuvenation refers to a series of different procedures, including caps, crowns and bonding that restore damaged teeth, and this type of rejuvenation can also significantly reduce your symptoms. TMJ affects multiple areas and systems in the human body. When you suffer from back or neck pain, you often don’t realize that it’s a sign of a more serious problem. TMJ can prevent your muscles, joints, nerves and tissues from working well together. The primary cause of the condition is usually some type of trauma that can be due to an accident or event or ongoing micro trauma but it can also occur because of other health conditions. Grinding your teeth at night keeps your teeth from being aligned in your mouth, and undergoing any type of trauma to the mouth can result in crooked or damaged teeth. TMJ full mouth reconstruction, also known as smile rejuvenation, uses a series of products to improve your smile and better align your teeth. Caps, crowns and other procedures restores damaged teeth and rebuilds your mouth, which reduces your symptoms. The single biggest change is in Vertical Dimension. As we age and our teeth wear down our face shortens. Dental crowns for TMJ are one of the more common types of restorative dentistry. Dentists can use this procedure to keep a dental bridge from slipping, to restore a damaged tooth or to hide a filling placed in a significantly damaged tooth. Made from a strong and durable material, a doctor will often use a crown after performing a root canal on a tooth that has so much decay that you might otherwise lose it. If you have a significant number of teeth missing, or you have a number of damaged teeth, the dentist can use a dental bridge as a TMJ treatment. A bridge consists of one or more false teeth that you hold in your mouth after the application of a dental cement. Dentists can use permanent bridges or temporary bridges that you can take out later. 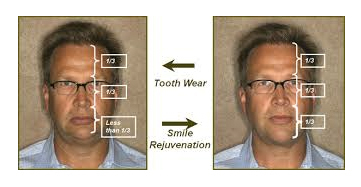 Other smile rejuvenation methods include veneers and dental bonding. With veneers for TMJ, the dentist will apply a type of durable material to your tooth that reduces the appearance of decay. If you opt for dental bonding, the dentist applies a resin material to damaged or broken areas to fill in gaps and strengthen your teeth. There are multiple ways that you can restore your smile and reduce your TMJ symptoms at the same time. This condition affects the nerves and joints in your face, and as those nerves connect to other nerves, you’ll likely experience some pain in your back, shoulders or neck as well. Dental bonding for TMJ is one type of mouth rejuvenation. Your dentist applies resin and a stronger material that bonds the resin to your teeth and saves a broken or damaged tooth. Other procedures can keep you from grinding in your sleep and hide gaps and spaces in your mouth. In my e-book, you’ll find other types of TMJ treatment options and what to think about before talking to your dentist. Download your copy today.